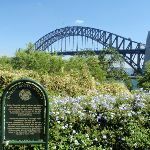 From the eastern (Broughton St) entrance to Milsons Point Station, this walk heads downhill whilst keeping the Harbour Bridge to your right. The footpath soon leads past a tunnel (on your right) then past the steps (leading up to the bridge), and soon crosses Fitzroty St (at the traffic lights, with the tunnel to your right). The walk continues down the hill towards the water, with the parkland under the bridge on your right. 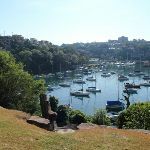 Near the water, the footpath leads to a great view over the harbour (just as the road bends left to wind steeply down the hill). 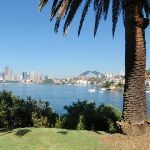 This informal lookout in Bradfield Park offers one of the best vantage points of Sydney city and a close-up Harbour Bridge. 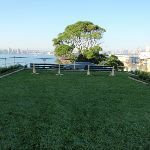 Located above air vents for the Sydney Harbour Tunnel, there is a large grassy clearing beside the car park (and a fairly busy road) and some fancy toilets down below (wheelchair accessible). Don’t expect to be alone when there is a special event on the harbour! Turn left: From the tunnel vent lookout, this walk heads away from the Harbour Bridge, heading downhill along Olympic Dr which soon bends right. 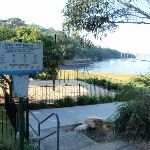 At the bottom of the hill, this walk turns left and follows the foreshore footpath a short distance to come to the ‘Jeffreys St Ferry Wharf’. 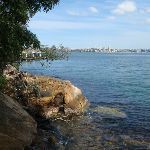 Continue straight: From Jeffreys St ferry wharf, this walk follows the foreshore footpath whilst keeping the harbour to your right. 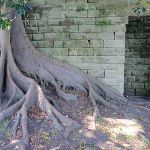 The walk heads over a bridge then past a large strangler fig tree beside a sandstone wall. 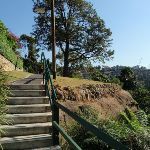 This foreshore walkway also passes several seats, steps, historic items and grand harbour views, and passes over a couple of bridges before turning left and heading up a long flight of steps. 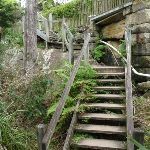 At the top of these steps, the walk comes to a large grassy reserve and the signposted ‘Dr Mary Booth Lookout’. 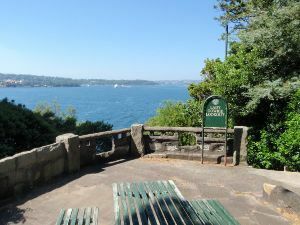 Offering a lovely view over Sydney Harbour and city, this lookout and reserve are named for Dr Mary Booth OBE(1869-1956). Dr Booth was a physician committed to the welfare of women, children and veterans, and was instrumental in the preservation of this space as public parkland. More info. Continue straight: From ‘Dr Mary Booth Lookout’, this walk heads away from the Harbour Bridge view and turns right to find the end of Waruda St. From here, the walk follows the footpath along the side of Waruda St which leads down to the intersection with Beulah St.
Continue straight: From the intersection, this walk heads along Waruda St whilst keeping the water glimpses to your right. 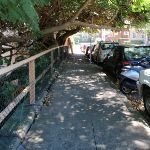 At the end of a Waruda St, the walk turns left and heads up the steps then follows the path to soon turn right onto Kirribilli Ave. The walk heads past a old white building to find the gate to ‘Admiralty House’. Admiralty House is the official NSW residence of Australia’s Governor-General. 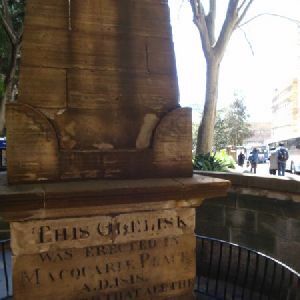 Originally part a larger land lease which included Kirribilli House, the oldest part of the stone building was completed in 1846 by Colonial Collector of Customs, Lt. Colonel J.G.N. Gibbes. 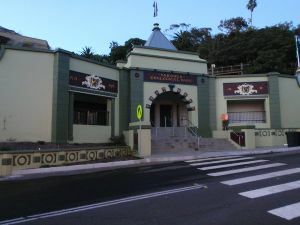 The building, named ‘Wotonga’, passed through a number of owners until 1885, when it was bought for the Admiral of the Royal Navy’s Australian Squadron. 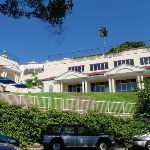 Amongst some controversy, the estate was handed to the Commonwealth government in 1913, and apart from five years during the Great Depression, has since been used for its current purpose. The grounds are usually open to the public once each year, commonly in spring. More info. 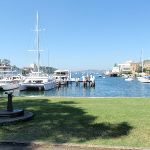 Continue straight: From Admiralty House, this walk follows Kirribilli Ave towards the water view (keeping Admiralty House to your right). 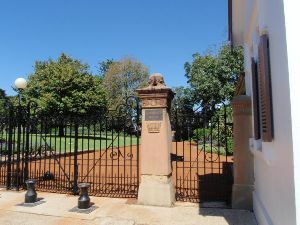 Soon the walk comes to another set of gates, Kirribilli House. 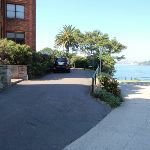 Continue straight: From Kirribilli House, this walk heads towards the end of Kirribilli Ave, towards the water view. 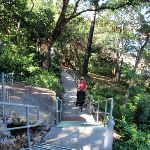 Just beyond the end of Kirribilli Ave, this walk heads down a few steps to come to the good views and signposted ‘Lady Gowrie Lookout’. At the end of this side trip, retrace your steps back to the main walk then Turn right. Kirribilli House is the official NSW residence of the Prime Minister of Australia. It was purchased from the Admiralty House estate in 1854, and the Gothic style residence was completed the following year by Adolphus Frederic Feez. 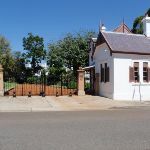 After several more owners, PM Hughes approved the compulsory acquisition of the property in 1920, to prevent the planned subdivision of the land. 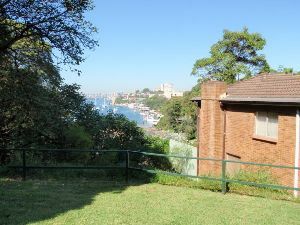 At first used as additional accommodation for Admiralty House, Kirribilli House was later leased to tenants for six years, before being restored for use by the Prime Minister of the day and international guests of the Commonwealth. 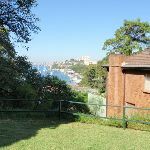 Kirribilli House is usually open to the pubic once each year, commonly in spring. More info. 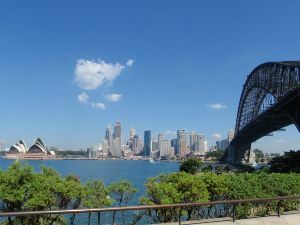 Lady Gowrie Lookout is located beside Kirribilli House, and overlooks the Sydney Harbour east of the CBD. 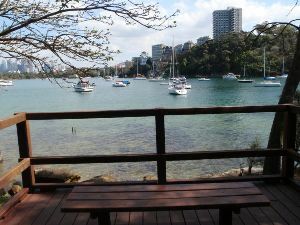 Offering a picnic table and a number of bench seats, visitors can wander down the old steps to the water’s edge. Ultimately ‘The Rt Hon The Dowager Countess of Gowrie’, Zara Hore-Ruthven (1879-1965) lobbied for the welfare of children in Australia, and also raised money for war veterans and other causes. Her husband, Alexander Hore-Ruthven, was Governor of South Australia and later NSW, and also Australia’s longest serving Governor-General(1936-1945). More info. 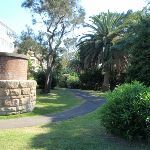 Turn left: From ‘Admiralty House’, this walk heads directly away from the gates to cross Kirribilli Ave and follow Carabella St. Soon Carabella St leads to a three-way intersection with Holbrook Ave (on your right). Continue straight: From the intersection, this walk heads north along Carabella St, initially keeping Holbrook Ave on your right (and the phone box to your left). Carabella St soon bends left, then a short time later this walk turns right into Peel St, then left into Elamang Ave. 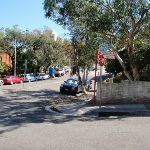 The walk soon passes ‘Loreto Kirribilli’ (school), then at the end of the Elamang Ave, this walk crosses the road to turn down McDougall St. A short distance down McDougall St, this walk comes to the entrance of the Ensemble Theatre. 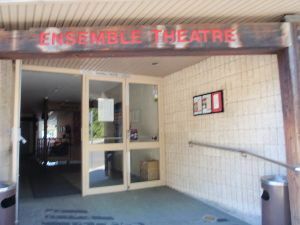 The Ensemble Theatre has been producing professional live theatre for longer than any other company in Australia. 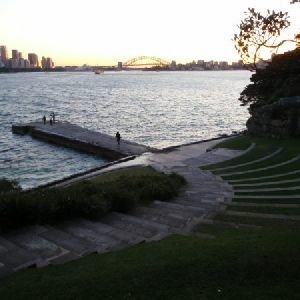 With two venues, this Kirribilli auditorium is well-known for the high-quality performances and the scenic location. 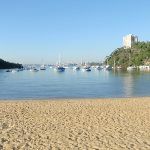 The site also offers Bayly’s Restaurant for fine dining, and is next door to Careening Cove Marina and the Sydney Flying Squadron, both of which house restaurants. More info. Continue straight: From the entrance ‘Ensemble Theatre’, this walk heads downhill along the footpath beside McDougall St. The path leads past the ‘Sydney Flying Squadron’ and turns right onto a gravel driveway leading into Milson Park. The walk heads around the locked gate to the grassy foreshore of Milson Park. 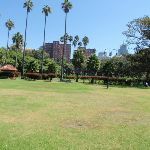 Milson Park is located on Careening Cove, and offers public toilets, open grassy areas and a children’s playground (separated from the road and waterways by a fence). A community garden was opened here in November 2009. Just adjacent to this park is the small Miss Gladys Carey Reserve, named for a ‘wonderful old lady who led a useful life’. More info. 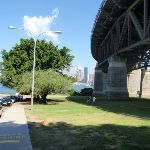 Continue straight: From Milson Park, this walk heads along the grassy foreshore, keeping the water to your right, and soon crosses a small bridge, finding ‘Kirribilli Marina’ at the end of ‘Bradley Ave’. Here the walk heads up the steps and continues up the hill past ‘Miss Gladys Carey Reserve’, soon coming to a ‘T’ intersection with High St. Here the walk turns left and follows High St and at the cross street, turns right to head uphill along Hipwood St. The walk follows Hipwood Street as it bends left then merges with Adderstone Ave, where this walk then turns right onto Clark Rd. A fairly short distance down Clark Rd (just past number one), the walk comes to an intersection with set of steps (on your right, that lead into Anderson Park). 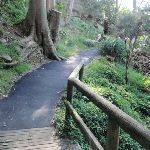 Turn right: From the intersection, this walk heads down the steps then across the small timber bridge into Anderson Park. 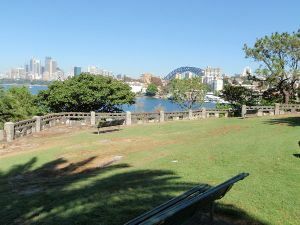 Here the walk follows the footpath along the foreshore and soon finds a semi-circular seating area with several plaques, a water view and a drinking fountain. The walk continues along the foreshore of the park to the far side to find a set of stairs heading up from between the toilets and Neutral Bay Marina. Named for John Anderson, local councillor 1891-1921, this is a popular sporting reserve. Offering facilities for cricket in summer and soccer in winter, this park also has a drinking fountain and an amenities block with toilets and showers. A number of plaques commemorate the historical significances of this place. 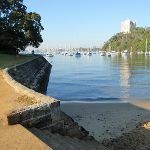 Continue straight: From Anderson Park, this walk heads up the steps from between the toilets and ‘Neutral Bay Marina’. The steps and footpath soon bend right and lead up behind the marina to find the footpath beside Kurraba Rd. Here, the walk turns right and continues up the hill, soon crossing Ben Boyd Rd, then about 20m further along Kurraba Rd, this walk turns right and takes the steps down to Manns Ave. The walk follows Manns Ave then crosses Hayes St to find the intersection with Wycombe Rd next to ‘Ta Ta Thai’. 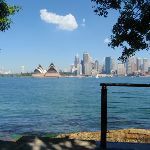 Continue straight: From the intersection, this walk heads downhill along Hayes Street, passing the shops to soon find the entrance to Neutral Bay (Hayes Street) Ferry Wharf, down the bottom on the left. At the end of this side trip, retrace your steps back to the main walk then Turn right. 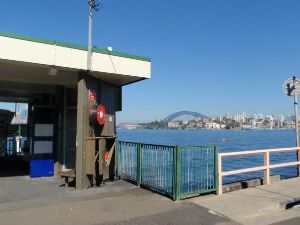 Neutral Bay (Hayes Street) Ferry Wharf makes the third stop on the Neutral Bay ferry service from Circular Quay. There is a bus stop and picnic table at this scenic wharf and, within a block, you’ll find restaurants, take-away food and boutique shops. Turn left: From the intersection, this walk follows ‘Wycombe Rd’ away from Hayes St. Just as Wycome Road bends left, this walk heads straight (right-ish) into Wallaringa Ave. Wallaringa Ave bends a couple of times and soon finds the signposted ‘Nutcote House’ on your right. Nutcote House was designed for May Gibbs, author and creator of the bush babies, Snugglepot and Cuddlepie. Gibbs is noted to be the first author ‘to give Australian children a fantasy world of their own’. Nutcote is open to the public Wednesday through Sunday 11am-3pm, and entry fees are $8 adult, $3 child, with family and concession rates available. For more information, phone (02) 9953 4453. More info. 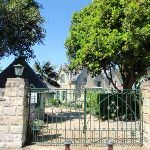 Continue straight: From Nutcote House, this walk heads along Wallaringa Ave, keeping the distant water views to your right. Soon the road bends left, and becomes Spains Wharf Rd. 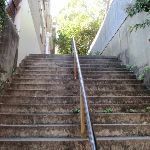 At the top of Spains Wharf Rd, this walk turns right and follows Kurraba Rd for a while until just past the phone box, where the footpath leads down some steps to find an intersection at the top of Kurraba ferry steps. Continue straight: From the intersection, this walk heads up the steps, keeping the Kurraba Road up to your left. 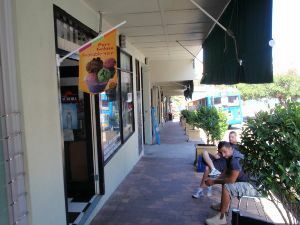 The footpath soon leads past the ‘Kurraba Wharf Store’ and a short distance later comes to a three-way intersection with Shellcove Rd. 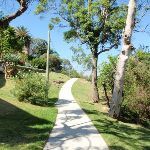 Veer right: From the intersection, this walk heads south-east along footpath beside Kurraba Rd, past a few apartment blocks to find a path signposted as the way to ‘Kurraba Point Reserve’(on the right, just past number 137). Continue straight: From the intersection, this walk heads uphill following the footpath beside Kurraba Rd. Soon the walk takes the left fork in the road and heads down past Hodgson Lookout and just beyond the intersection with Baden Rd, to a small park and ‘Spains Lookout’ At the end of this side trip, retrace your steps back to the main walk then Turn right. 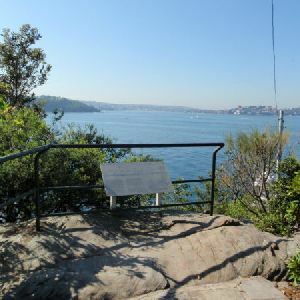 Spains Lookout is in Kurraba Point Reserve, and offers a glorious view of Sydney Harbour, including the distant bridge past Kirribilli. 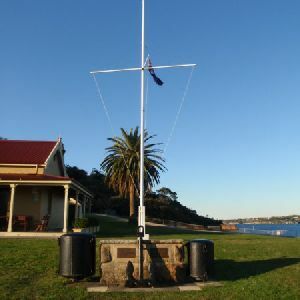 The lookout was named for Captain Stanley Spain in 1937, a well-known local councillor. More info. 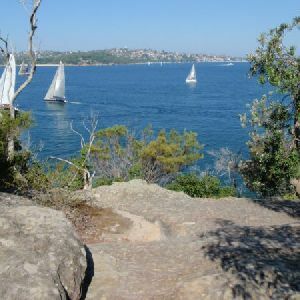 Kurraba Point Reserve, previously known as Thrupp’s Point and Ballast Point, was at one time a sandstone quarry. 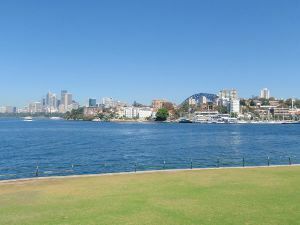 More recently, it has been regenerated into a grassy parkland, with harbour views that are very popular during special events. 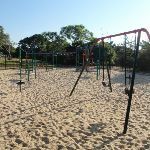 There is also a children’s playground and many shady trees, and people can often be spotted with a fishing line in the water. Veer left: From the intersection, this walk heads along Shellcove Rd, which soon bends left and passes the ‘Shellcove Road Jetty’ path. The walk continues along the road and turns right into Honda Rd, then continues past ‘Honda’ house – the 1858 home of architect Grundy. 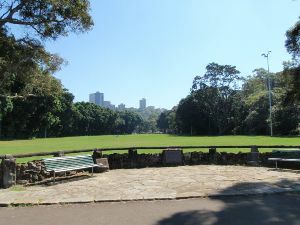 The walk turns right into Bogota Ave which soon bends left and immediately finds a small park, an archway  and lookout. Near the Bogota Ave entrance to Cremorne Reserve, this informal, fenced lookout takes in a partial view over Sydney Harbour. There is a bench seat, and a sign nearby with information about the park. For a more interesting view, visitors can go a short way into the reserve and take the steps down onto the beach/mud flat. 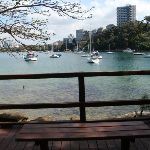 Cremorne Reserve is a very popular park, offering a scenic walking track around the edges of Cremorne Point. 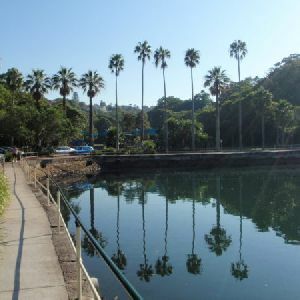 It houses a ferry wharf, gardens and a pool, as well as a playground, cafe, picnic area and a number of public bathrooms. Turn right: From the bend in Bogota Ave opposite number 9, this walk heads under the ‘Cremorne Reservation’ archway and follows the path past the information signs. The path soon leads down some steps then past a less defined side track to Shell Cove Beach (on your right). The walk continues along the concrete path and after ≈140m comes to a small clearing with some more information signs and water views. The path continues behind the houses and soon passes the ‘Cammeraygal Water View’ information sign opposite a sandstone cave (on your left), ignoring the side paths to the houses along the way. After a further ≈180m, the path leads to a three-way intersection in an open area marked with ‘Path to Milson Rd’ sign (pointing left). Continue straight: From the intersection, this walk follows the ‘Maccallum Pool’ sign along the path, keeping the water views to your right. Soon the path leads to a ‘Y’ intersection in front of an apartment building (the path on the right leads to Maccallum Pool). Veer right: From the intersection, this walk heads downhill towards the water along the concrete path. The path soon passes a ‘The Rock Pool that Grew’ information sign then goes down the steps. The walk continues down this path and steps and soon comes to the northern entrance of ‘Maccallum Pool’. At the end of this side trip, retrace your steps back to the main walk then Turn sharp right. 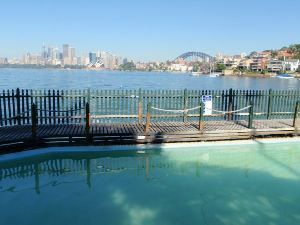 Maccallum Pool is a harbour-side swimming pool, thought to have been originally constructed by Olympic swimmer Frederick Lane. It was restored in the 1920s by local residents, notably Hugh Maccallum. In 1930, the council took control of the pool, and bestowed the current name. More info. Continue straight: From the intersection, this walk heads along the main concrete path, keeping the houses to your left and the water views to your right. After â70m, the path passes a drinking fountain and passes another side path (on your right). The walk continues along the main concrete path for â200m through the parkland, past a ‘Cremorne Reserve’ sign and comes to a ‘T’ intersection with the footpath on Milson Rd. Veer left: From the intersection, this walk crosses Milson St, turns right and heads along what looks like a driveway (and is a driveway for a short time), keeping the water and Milson Rd to your right. 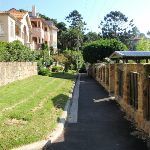 The driveway soon narrows into a footpath, which this walk follows between the houses and palm trees. Just after the last house, the path comes to an intersection (with Sophie’s Lookout and plaque on your right at the top of the steps) before the toilet and play area. 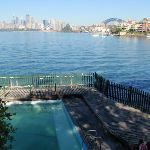 This unofficial lookout takes in sweeping views across Sydney Harbour, over top of Cremorne Point Wharf and ‘Sophie’s Place’ cafe. The lookout is dedicated to Sophie Vaillant, long-term proprietor of the cafe below. Cremorne Point Ferry Wharf marks the first stop on the Mosman Ferry Service. The wharf is home to Sophie’s Place cafe, serving coffee, food and drinks. A public phone, public toilets and a children’s playground can all be found within 100m of this wharf. More info. 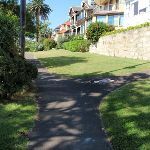 Veer right: From the intersection, this walk heads along the footpath directly away from the house, heading towards the toilet block and playground. The path leads past this park area and heads into the bush, then passes a couple of information signs to find a concrete rock cairn, built for the ‘Clan of Donnachaidh’ in 1988 (each rock has its town of origin carved in it). The walk then continues along the path past a picnic table (with views and some shade) to find the lookout at Robertsons Point. 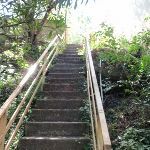 (There is a track with steps and ladder that continues further down to the very tip of the point for the adventurous). At the end of this side trip, retrace your steps back to the main walk then Veer right. 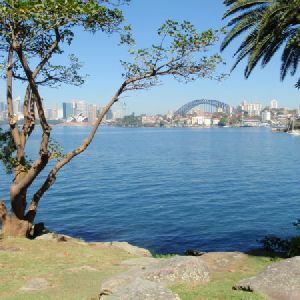 Robertsons Point, also known as Cremorne Point, is home to Cremorne Reserve. At the very tip, visitors can wander down some old steps to the lighthouse, and the more adventurous can continue down a rather precarious ladder to the water’s edge. 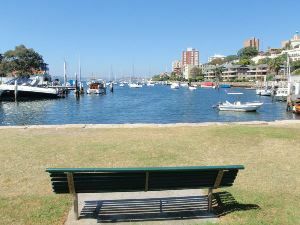 The spectacular harbour views can be enjoyed from a number of bench seats. A memorial plaque reminds visitors to take extra care and respect the inherent dangers of the rocky coast. 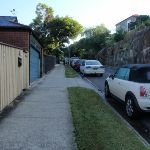 Turn left: From the intersection, this walk heads along the footpath, keeping the houses to your left (that is, use the footpath on the far side of the houses from the wharf and road). 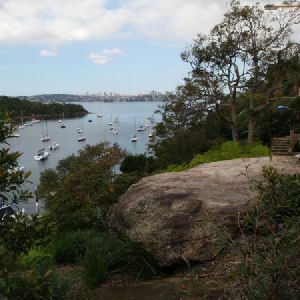 The footpath leads behind the houses, enjoying the water views (on your right) and after about â250m, the path leads past a ‘The Illustrated Sydney News’ information sign. Here the walk continues for a short time further to a clear three-way intersection and a drinking fountain. 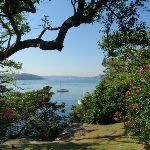 The Lex and Ruby Graham Garden at Cremorne Point is quite remarkable, worthy of a little extra time on your walk. A chance planting of a tropical ‘Elephant’s Ear’ bulb in 1959, which happened to thrive, led to a lifetime work for Lex Graham and his future wife, Ruby. They worked steadily for decades, clearing weeds and rubbish, improving the soil and building up the gardens with donated plants and cuttings. 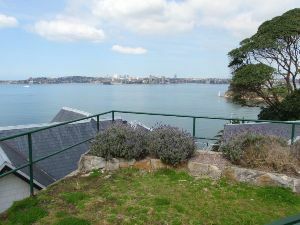 Continue straight: From the intersection, this walk heads along the main foreshore track, keeping the house to your left. 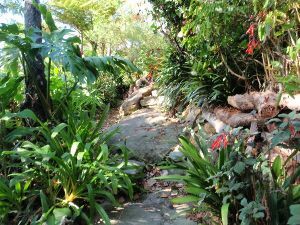 The path almost immediately passes the northern end of the signposted ‘Elephant’s Ear’ garden and continues past some other exotic gardens behind the houses, whilst keeping the water views to your right. After ≈200m, the path leads to an information signabout the constructed environment and then to a clearing with a sandstone rotunda. 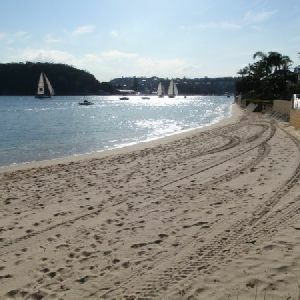 There is a four-way intersection just above the ‘Sydney Amateur Sailing Club’ (on your right). Continue straight: From the intersection, this walk follows the ‘Old Cremorne Wharf’ sign sign gently uphill along the path, keeping the water to your right. 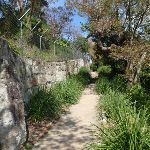 The path soon comes to another intersection where this walk tends right, following the path for about 120m (passing a few informal side tracks) to find some large sandstone boulders and the entrance to the ‘Old Cremorne’ Ferry Wharf. Turn left: From the Old Cremorne Ferry Wharf entrance, this walk follows the footpath away from the power lines keeping the water to your right. The path leads up the hill and after ≈180m, the path heads up a set of steps. The path continues to enjoy water views (to your right), passing behind a row of houses. 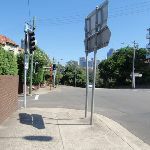 Soon the path bends left to pass a ‘Cremorne Point’ sign and find a clear three-way intersection and a bench seat. 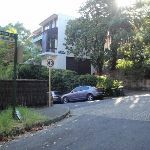 Turn right: From the intersection, this walk follows the ‘Bromley Ave’ sign along the footpath (not actually a road) between the row of houses to find a four-way intersection at the last house, number five. Continue straight: From 5 Bromley Ave, this walk heads down the steps and follows the path to cross the timber bridge over the valley. 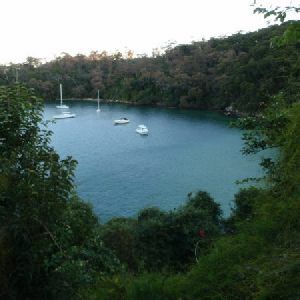 The walk bends right and follows the path for ≈250m, enjoying the water views to your right. The path then passes a ‘Harnett Park’ sign (and ignores the upper track on your left), then heads down some steps and turns left. 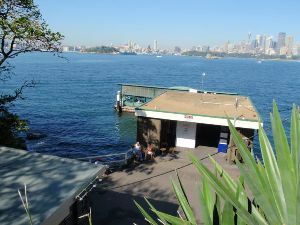 The walk heads past the ‘Rowers Restaurant’ to a car park and the Mosman Bay Marina. 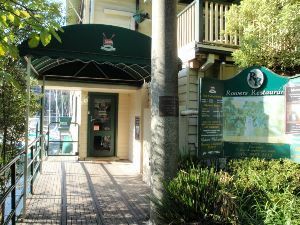 Located deep in Mosmans Bay, the Rowers Restaurant is part of Mosman Rowers Club (distinct from Mosman Rowing Club at the Spit), between Mosman Marina and Sea Scouts Hall. Open to the public, the club houses a bistro, restaurant and bar, which are open for lunch and dinner daily, as well as breakfast on Sundays. For more information, call 9953 7966. More info. 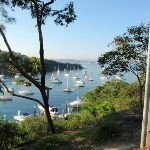 Continue straight: From Mosman Bay Marina, this walk follows the waterside footpath, keeping the water to your right. The path soon bends right to round to the apex of Mosmans Bay opposite ‘Reid Park’ and a children’s playground. 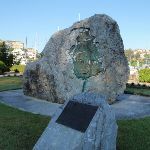 Here the walk continues around the bay and after ≈110m, comes to a large rock commemorating ‘H.M.S Sirius’. 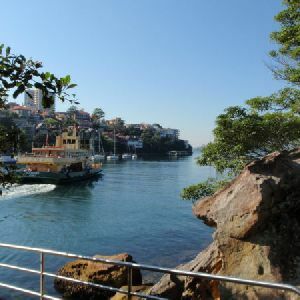 The walk then continues ≈90m to the bush shelter and the entrance to Mosman Bay Ferry Wharf. 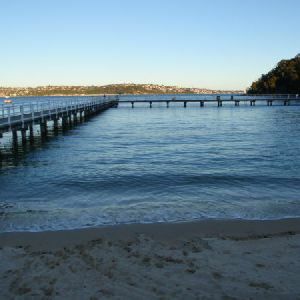 Mosman Bay ferry wharf, located on Avenue Rd, is nestled in the deep Mosmans Bay, opposite the marina. 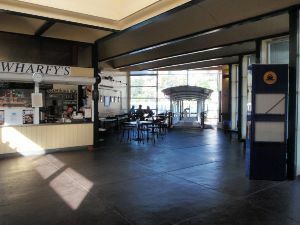 The wharf houses Wharfy’s cafe. Open weekdays 7am-2pm and weekends 7am-4pm, for more information call (02) 9968-3569. 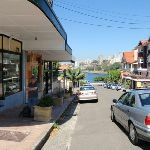 Across the road is Mosman Wharf Store, selling groceries and snacks, newspapers, bait and travel tickets. Open weekdays 7am-7pm, Sat 8am-6pm & Sun 8am-2pm, for more information, call (02) 9969 9369. 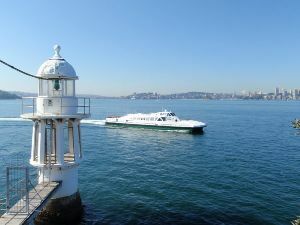 Turn left: From Mosman Bay Ferry Wharf, this walk heads up the steps opposite the wharf, next to the ‘Mosman Wharf Store’. This path continues up the hill and up some more steps, and then crosses a minor road and heads up a ramp. 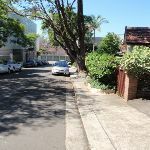 Here the walk turns right and follows Mosman St. Mosman St soon bends left (and becomes Trumfield Lane) which continues up the hill to a ‘T’ intersection with McLeod St. 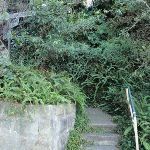 This walk crosses McLeod St to find a driveway (just a bit to the right) and turns left, following the steps and footpath up the hill. This footpath soon leads to an intersection with Musgrave Street. Turn right: From the intersection, this walk heads downhill along ‘Musgrave St’ towards the distant water views. 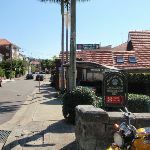 At the end of the street, the walk comes to a turning area, bus stop, shelter and the entrance to the ‘South Mosman Wharf’. 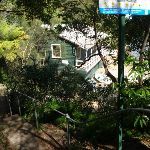 Continue straight: From the shelter at the entrance to South Mosman Wharf, this walk heads downhill to soon turn left and heads up the steps next to the ‘Exploring Curlew Camp Artists’ Walk’ sign. Soon the walk turns right at the ‘T’ intersection partway up the stairs then continues up ignoring the private property side paths to find the end of a short road. 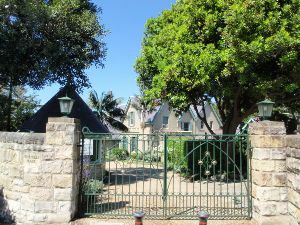 Here the walk follows the road to the intersection with Raglan St and the ‘Curraghbeena Point Lookout’ in front of ‘The Castle’. Curraghbeena Point separates Little Sirius Cove from Mosmans Bay (formerly Sirius Cove). 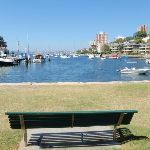 This well-kept little park at the point offers some lovely views over Sydney Harbour, with two bench seats and a drinking fountain nestled amongst the buildings. Turn left: From ‘Curraghbeena Point Lookout’, this walk heads up the hill following Raglan Street soon passing ‘Herron Park’ (on your left) then just before the sandstone wall (on the right) this walk turn right into the sandstone driveway then follows the ‘Public Path’ sign up the steps. At the top the path passes beside a house and then follows a short section of Raglan St to turn right into Curraghbeena Rd (near the playground and park). Here the walk heads down Curraghbeena Rd passing a lookout (on your right) and continues down the road to the very end where there is an intersection with a walking track and steps. 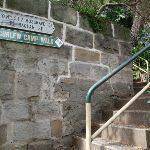 Turn right: From the end of Curraghbeena Road, the walk follows the ‘Curlew Camp Walk’ sign down the stairs next to the sandstone wall towards the water. at the bottom of these steps the walk comes to a telegraph pole and great unfenced water view. Here the walk turns left and follows a footpath behind the houses then down a few timber stairs cases. Here the walk follows the track through the bush to soon head up a few of steps onto Curlew Camp Road where there is a sign pointing back to ‘Walking track to Curraghbeena Road’. Turn right: From the intersection, this walk heads up the hill along the narrow concrete road, keeping the houses to your left. Soon the road leads to an intersection with Illawarra St and some stairs (on your right). 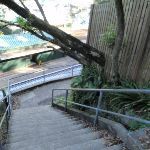 Turn right: From the intersection, this walk heads down the series of steps and along the footpath beside the children’s playground. The walk then continues across the grassy clearing to the middle of Sirius Cove Reserve. Sirius Cove Reserve is next to the sandy beach of Little Sirius Cove, Mosman. 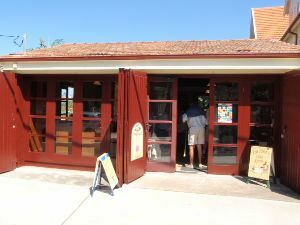 The reserve is open and grassy, with a few picnic tables, a fenced playground and drinking fountain at the western end, and a toilet block at the eastern end. 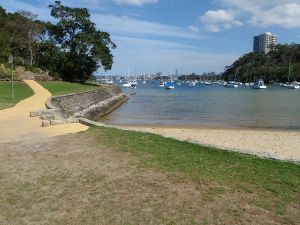 The beach has no surf and faces south to Cremorne Point. Road access is via Sirius Cove Road. 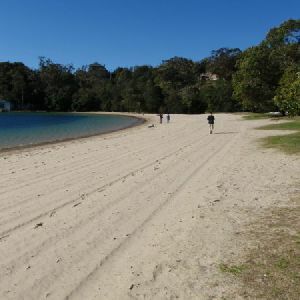 Veer right: From the intersection, this walk heads along the park foreshore with the water to your right, then heads up the hill bending right. The walk follows the footpath below some houses and past a small beach with a two-storey scout hall. Just after the last house, the path comes to a three-way intersection at the start of a large wall/fence. There is a ‘Curlew Camp’ sign pointing back to ‘Sirius Cove’. Continue straight: From the intersection, this walk follows the sign pointing to ‘Curlew Camp’, following the footpath beside the tall barbed wire fence and wall. The track leads over a few sections of boardwalk, and soon comes to an intersection (with a track on the right marked with another ‘Curlew Camp’ sign, pointing ‘130 metres’. Turn right: From the intersection, this walk heads down the hill following the ‘Welcome to Curlew Camp’ sign. The track quickly turns right, over a boardwalk, then turns left down more stairs. The walk then winds down the hill to the corner of a large rock, just above the water. Continue straight: From the intersection, this walk heads down towards the water and onto the wooden platform. At the end of this side trip, retrace your steps back to the main walk then Continue straight. Camp Curlew was created in 1890 as an artists’ retreat, as was popular at the time. Artists of the day would visit for long periods (although women were not permitted to stay overnight), enjoying the surrounds and painting some of Australia’s most prized works. Arthur Streeton is a notable artist who stayed at the camp. The site was less than rustic, with tents to accommodate billiards and dining, and also a hired cook and youth to help with odd jobs. Camp Curlew was abandoned after the siting of Taronga Zoo in the area in 1912. Turn left: From the intersection, this walk heads along the fenceline, with the water below on the right of the track. The walk heads along large sections of boardwalk with a tall barbed- wire fence above on the left. After approximately 300m, the track turns left above a small beach and then after the beach turns right. 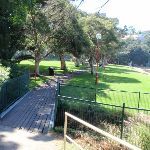 The walk continues along the hillside, with the tall fence on the left, then heads up boardwalked steps and passes a building on the left before crossing the cul-de-sac to Taronga Zoo wharf. 4.4km of this walk has gentle hills with occasional steps and another 3.7km is flat with no steps. The remaining (1.6km) has short steep hills. 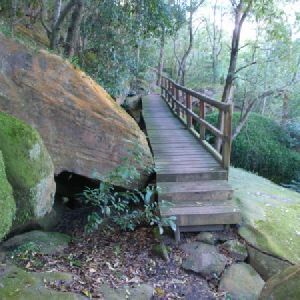 Around 9km of this walk follows a smooth and hardened path, whilst the remaining 940m follows a clear and well formed track or trail. This whole walk, 10km is clearly signposted. This whole walk, 10km requires no previous bushwalking experience. This whole walk, 10km is not usually affected by severe weather events (that would unexpectedly impact safety and navigation). 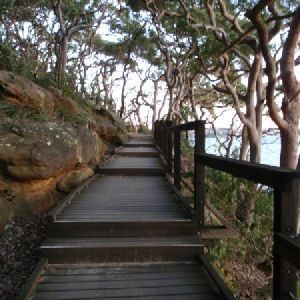 Around 10km of this walk is close to useful facilities (such as fenced cliffs and seats), whilst the remaining 160m has limited facilities (such as not all cliffs fenced). 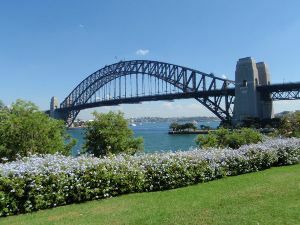 A list of walks that share part of the track with the Harbour Bridge to Taronga Zoo walk. 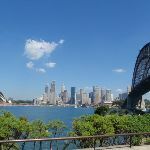 A list of walks that start near the Harbour Bridge to Taronga Zoo walk. 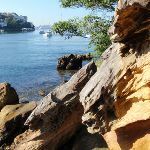 This walk is the southern most stretch of the Great North Walk and spends much of the time exploring the scenic and historic urban areas around Woolwich and Hunters Hill. 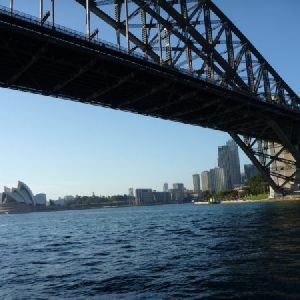 Starting at the birth place of modern Sydney you soon enjoy a ferry ride across the world renowned harbour, passing the Opera House and heading under the Harbour Bridge. 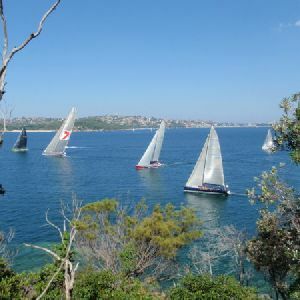 Once on dry land again you will explore the streets and some lovely pockets of remnant bushland of this peninsula. 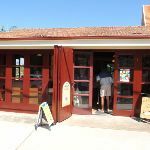 There are a few chances to stop at a cafe along the way before coming to open area at Boronia Park. http://new.wildwalks.com/wildwalks_custom/includes/walk_fire_danger.php?walkid=nsw-cremorner-hbttz Each park may have its own fire ban, this rating is only valid for today and is based on information from the RFS Please check the RFS Website for more information.